Condo sur la plage à partir de 85 $ / nt! Budget direct sur la plage! Ce condo est à vendre et vous devez nous permettre de montrer le condo à tous les acheteurs potentiels (avec un préavis de 24 heures, bien sûr). Nous prévoyons que cela se produira environ une fois par semaine. Nous offrons des tarifs plus bas pour les longs séjours en raison de ce désagrément possible. Décrit dans le Oahu Revealed 'Guide comme un «véritable joyau», le bâtiment Makaha Beach Cabanas se trouve directement sur une plage de sable cachée à côté de LahiLahi point sur la rive ouest de Oahu. Regardez magnifiques couchers de soleil de la véranda tout en profitant de Mai Tais, et regarder le diaporama de la lune dans l'océan, à l'aube de votre lit! Dormir au son des vagues, batifoler sur la plage et regarder les tortues de mer, les dauphins et les baleines (en saison)! Notre condo d'une chambre est un deuxième étage, la fin de l'angle UNIT- pratique à la plage, sans danger pour les enfants et facile pour les personnes âgées! Meublé avec tout ce qu'il faut pour un amusement, des vacances reposantes! Nouvellement rénové, le plan d'étage est super flexible - un lit queen size Murphy lit dans la chambre et un canapé-lit queen-size dans le salon vous permet de convertir la chambre à coucher en bord de mer dans un salon si vous préférez! Les tarifs sont basés sur une occupation de 2 personnes; des taux plus élevés sont applicables pour les personnes supplémentaires et les périodes de vacances. Nous acceptons les paiements automatiques VRBO, les cartes de crédit via Paypal, ainsi que les chèques et les mandats. Fabulous location but a dated condo! There is no doubt that the location of this condo on the second floor, overlooking the beach is fantastic. The condo itself could be much improved. It is old fashioned, dismal and quite shabby. The furnishings are old, dated and uninspiring. It needs a total facelift. The worst aspect of this condo were the pillows on the bed. They were all stained and one had old, dried blood on it! Completely unacceptable and unhygienic. When we arrived we found that the whole of the condo wasn't as clean as we would have expected it to be. The cream curtains in the bedroom were very dirty. There was a lot of outdated food left in the fridge and cupboards. We would not choose this particular condo again unless it had been freshened up. We had a wonderful time at Makaha but were very disappointed with the condo. We totally agree that the condo needs updating; the items in it are 5 years old.... as a matter of fact, new furniture items were added/replaced as soon as you checked out. We are selling this condo at the end of the month (at a discounted price compared to the newly renovated ones) and don't want to do fancy upgrades as we wont get the money back out of it....we decided to sell at a lower price and let the new owners remodel to their taste. The condo DOES look exactly like the photos, and the discounted rental price reflects it ( the upgraded ones are up to $1000 more per month than you paid). I'm sad that you didn't call our on-island contact to ask for new pillows or anything else you needed----- she lives right down the block, she could have brought you those items easily! Our stay at the Makaha Beach Cabanas was wonderful! Hope was there to greet us and made us feel at home. The unit was just the right amount of space for the two of us. It's bright, clean, quiet, well maintained, and fully loaded. So all you need to bring is you bathing suit! The best part is it overlooks the ocean-- it's so close, you fall asleep listening to the sound of waves hitting the shore. Every night we ate dinner on the balcony table and watched the sun set. It was so perfect, we felt like we were in a movie. The beach is big and sandy, the water is incredible, and it's never crowded. The apartment building is inhabited by both locals and tourist alike for a nice mix. The locals are very nice. If you're like us and don't want to rent a car, fear not because transit rocks. There's a bus stop a minute walk away from the complex and buses run every 12 minutes or so. They've also got 24 hour security, which made us feel even safer. In my opinion, Makaha is the best place to vacation in Oahu and Hope is the best person to stay with. It's not overly crowded and full of tourists like Honolulu is. Needless to say, our trip was nothing short of perfect. I've stayed in oceanfront hotels before, but the view from the bedroom here was like an eternity pool of sand & sea. The beautiful private beach was great for both playing in the waves or snorkeling with the turtles. Hope was great as a host as well as a source for information of the local area for hiking , snorkeling & restaurants. The condo was fully stocked & clean. There was snorkel gear, towels & even a beach umbrella. Sleeping with the patio door open, w/ a cool breeze, listening to the waves & seeing the moon out over the ocean was surreal. I'll be back!!! 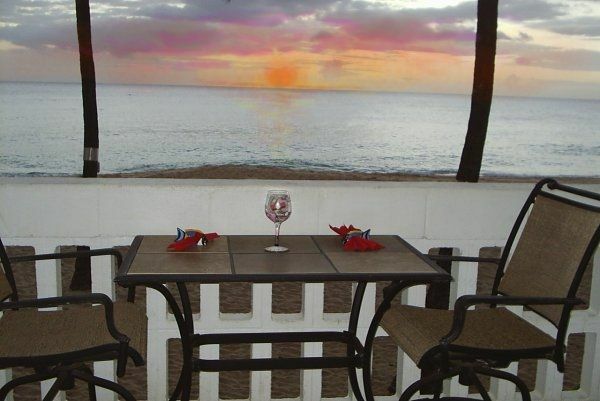 Few years ago we decided to spend the month of February at Makaha Beach Cabanas. This was such a success that we are now planning for the 5th year in a row to stay there. We love the beach, the waves, sounds of the ocean at night and that this is far away from the typical tourist areas. Rates are subject to change until reservation is confirmed. High season rates apply to all American holidays. A refundable damage deposit of $200 is required.